Long Beach Unified School District Board of Education President Felton Williams has been elected chair of the Council of the Great City Schools, the primary coalition of the nation's largest school districts. The Washington, D.C.-based Council includes 72 school districts as members, representing more than 7.2 million students. “With Dr. Williams’ leadership experience in Long Beach, we are confident that the Council’s board will steer urban school reforms forward,” said Council Executive Director Michael Casserly. Williams will succeed Superintendent Richard Carranza of the San Francisco Unified School District, effective July 1, to lead the policymaking body of the national coalition. The Council’s board is composed of the superintendent and a school board member from each of the districts. Currently serving as the Council’s chair-elect, Williams moves up to head the board while Chancellor Kaya Henderson of the District of Columbia Public Schools will assume his post. And to round out the leadership team for the upcoming 2016-17 school year, Lawrence Feldman, school board member of the Miami-Dade County Public Schools, was elected secretary-treasurer to succeed Henderson. NATIONAL LEADERSHIP – Felton Williams is working with the Council of the Great City Schools and the White House on an initiative to improve the achievement of students of color. 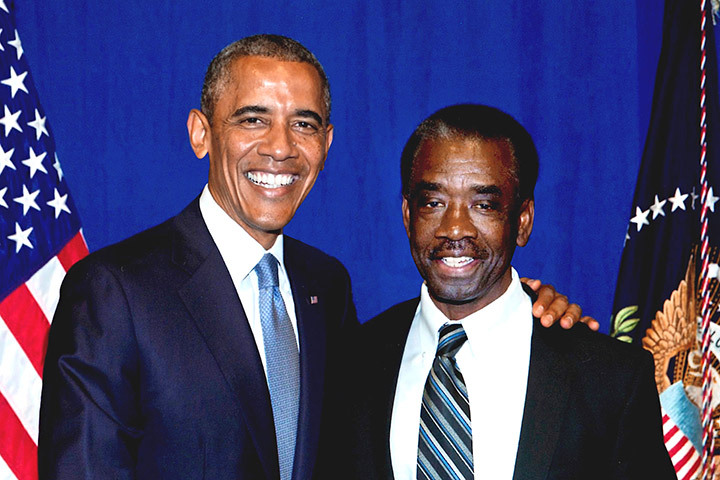 Williams met President Obama during the initiative's launch at the White House in July 2014.